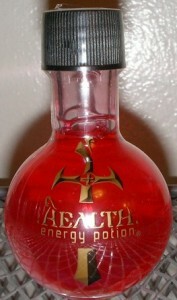 Health Energy Potion is made by Harcos who also make Mana Energy Potion. This video game inspired energy shot has concentrated caffeine and isn't recommend for kid gamers. Today, I embarked on an epic quest to continue my higher education; an arduous journey across campus to the destination that is my classroom. Many of those trekking beside me in the caravan were lost along the way, battered and unable to continue in the harsh elements. I, a level 73 barbarian scholar, was able to outlast the rest of the noobs due to my high max HP. As the classroom neared closer, though, I feared I would not be able to last through a whole class. Cursing myself for not adding more EXP to my stamina, I stumbled onto a wooden chest right in the open. This seems odd in concept, but actually happens a lot. I did not have any keys in my inventory and I am a barbarian, not an assassin, so I cannot pick locks. Luckily, the chest was unlocked. I opened the chest and found exactly what I needed. A health potion! The spirit of the elders was surely with me today. Let me tell you why the health potion rescued me. This energy shot is reported to have a “mellow apple-cinnamon” flavor. Truthfully, I didn’t taste that at all. This is kind of what Chaser 5 Hour Energy would taste like if it used real sugar, even though this shot itself is sugar free. It’s nothing wholly spectacular, but it is certainly a pleasurable experience that doesn’t leave you asking “oh God, what did I just do?” like some other shots I’ve downed before. It’s smooth, it’s fruity, and it’s sweet. A job well done. This is one of the few energy shots out there that actually has kept to their roots. So many energy shots on the market today are too busy trying to copy Chaser 5 Hour Energy’s ingredient strategy (little caffeine, load up the B-Vitamins), that they forget this whole market is built on caffeine. Don’t get me wrong, Chaser 5 Hour shots are incredibly effective. It’s just refreshing to see a manufacturer that can think for themselves. That being said, this shot has 160mg of caffeine. Wait, I mean this shot gives you +160 HP. Combine that with over 1700% of your daily value in B-vitamins and a bunch of other “energy potion” ingredients I can’t pronounce, you’ve got a shot that just might do the trick. In fact, this shot does do the trick! B-vitamin shots are great for a long smooth energy boost, but they lack the coveted caffeine rush. This shot picks up that slack. You get a nice jolt of energy that slowly dissipates into the energy provided by the B-vitamins and remaining energy ingredients. Harcos, the makers of this drink, did not put all their work into the design department as one might expect based on the clever packaging (you have to have played WoW or Diablo to appreciate the looks of this drink, so don’t be discouraged if you’re lost). The taste and energy effect are just as well designed. If you’re an MMO gamer looking for an energy boost for some late night sessions (hell cow runs, anyone? ), this is your go-to energy boost! Now for next week’s test, I’ll need to track down some Mana Energy Potion because it’s going to take some serious magic to pull it off! How Does Health Energy Potion Compare? Health Energy Potion contains 80.00 mgs of caffeine per fluid ounce (270.51mg/100 ml).